There's a moment in every high school football game, an instant that makes the difference, a play that lifts one team to victory and sends the other to defeat. For Week 4 of the 2018 Oregon high school football season, here's a look back at the Plays of the Day. To see complete game stories from all these contests, go to the Prep Football Tab. 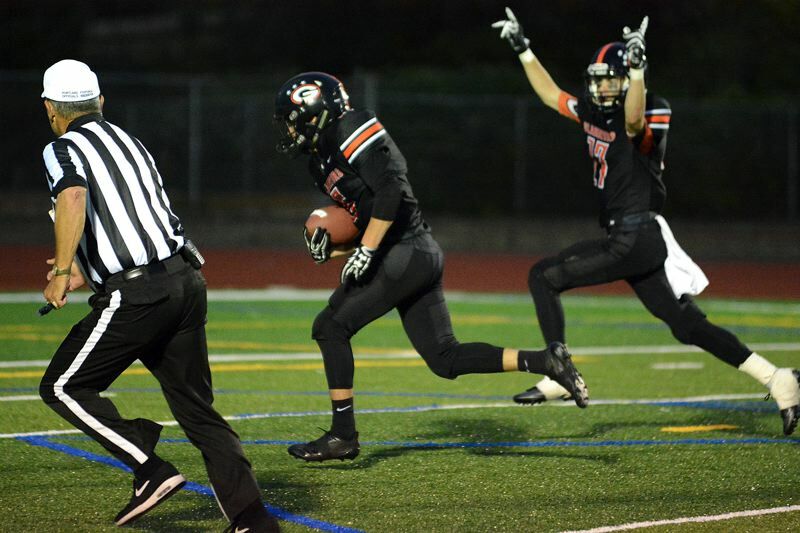 CLACKAMAS 49, LAKE OSWEGO 39: Trailing 39-36, Clackamas junior wide receiver Richard Kennewell scored the go-ahead touchdown when he caught a 9-yard pass from Caleb Jordan with 22 seconds to play, lifting the No. 2 Cavaliers to a dramatic home win Friday over the top-ranked Lakers. Kennewell appeared to catch the ball beyond the back of the end zone, but the play was ruled a TD and helped the defending state champions rally from a 39-28 deficit with 6:51 to play. Did Kennewell think he was in the end zone or out when he caught the ball? "Honestly, I don't know," he said. "They called touchdown, so I say touchdown, and I'm cool with it." Kennewell, who also caught a 48-yard touchdown pass from Jordan in the second quarter, finished with eight receptions for 233 yards and two scores. 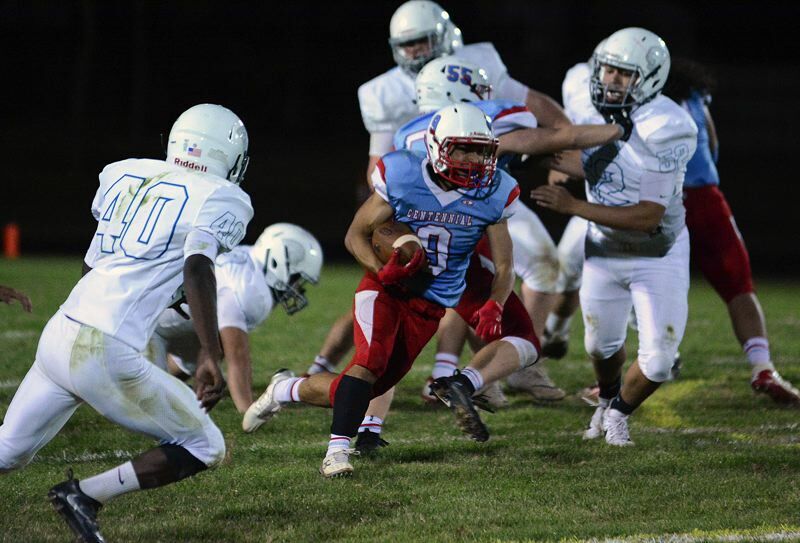 ST. HELENS 42, WILSON 35: The Lions trailed 35-34 on Friday when, with 20.5 seconds left, St. Helens junior Cody Woodruff streaked down the right sideline and hauled in a 23-yard pass from sophomore quarterback Jakob Robbins in the end zone to give the Lions the win at home. St. Helens used its four wide-receiver formation and got the winning pass on "Georgia," a Hail Mary-type throw that had also worked the play before, with Robbins hitting Woodruff for 31 yards. WOODBURN 21, NORTH MARION 0: After posting its first shutout in more than a decade, Woodburn only needed one touchdown to get the job done on Friday night against North Marion. But it was their second touchdown of the night that brought the house down in both teams' first league game. 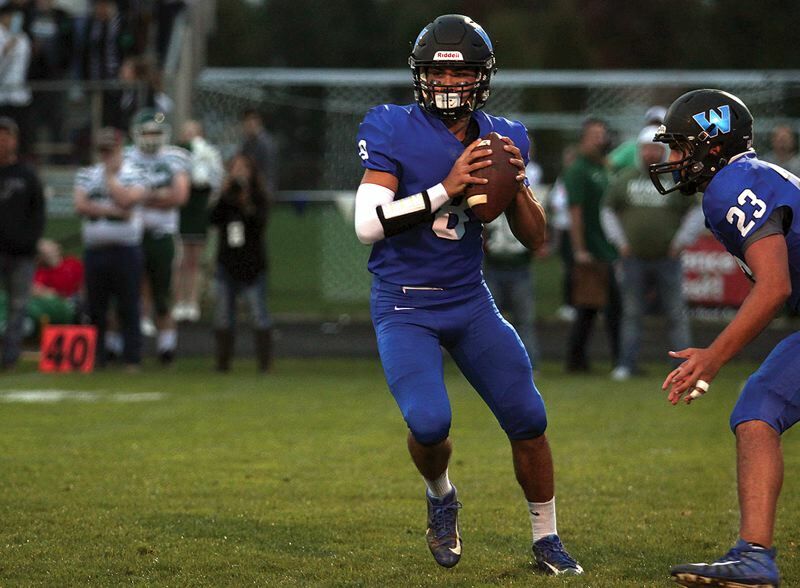 Leading 7-0 late in the first quarter, Woodburn quarterback Nate Corpuz eluded a North Marion blitz to find fellow senior R.J. Veliz down the right side of the field for a 60-yard touchdown that put Woodburn up 13-0 and helped the team improve to 4-0 on the season. GLADSTONE 42, ESTACADA 22: Gladstone's Austin Conner swooped into the backfield, scooped up an Estacada fumble and went 16 yards to the end zone to put the Gladiators up 14-0 in the first quarter. Gladstone would extend that margin to 28-0 by the early stages of the third quarter in their win over a Rangers squad that had topped the Class 4A rankings coming into the night. TIGARD 45, LINCOLN 13: Tigard sophomore Spencer Kuffel made a tackle for a loss and senior teammate Noah Jackman notched a sack to force Lincoln into a quick three-and-out. After fielding a one-hop snap on the ensuing punt, Lincoln's Jake Leitgel saw his kick blocked by Tiger senior Hayden McDonald, who scooped up the ball at the 6-yard line and then ran into the end zone for his first touchdown since he was a junior varsity tight end. CENTENNIAL 55, CENTURY 28: Centennial fullback Nick Garcia broke through the middle untouched for a 56-yard touchdown to put the Eagles up 35-6 early in the second half. Centennial would then score on drives of two plays, two plays and three plays on its way to building a 55-12 lead. BEAVERTON 46, WESTVIEW 34: Down 13-0 in the first quarter against Westview, Beaverton responded on the subsequent drive when Carson Budke took a shotgun snap, ran left and pitched the ball back to Trent Walker, who was moving right to left behind the line of scrimmage. Walker bought time with his legs by pretending he was going to take off downfield, but just as the Wildcat defense converged in him, the sophomore lofted a perfect spiral to a wide-open Ben Mackinnon who reeled in the ball along the right sideline and raced to paydirt to bring Beaverton with 13-7 with 7:40 left in the first quarter. 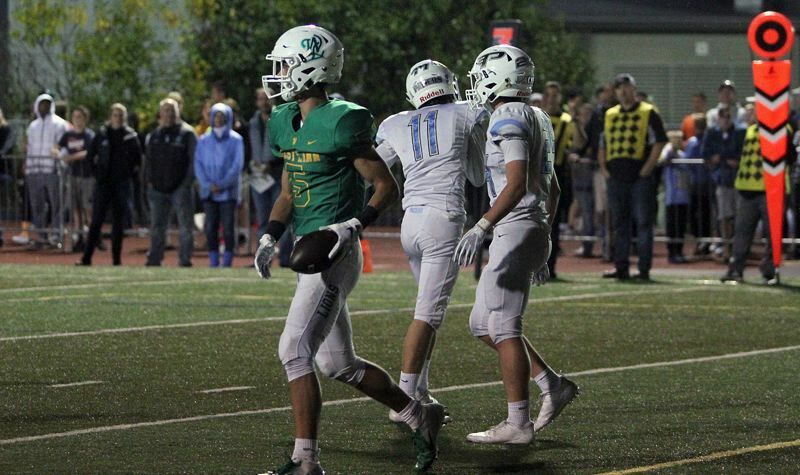 WEST LINN 45, LAKERIDGE 28: After Lakeridge rallied back within a touchdown of West Linn on Friday night — closing within 35-28 on a Jalen John TD run with 8:13 to play — the Lions finally pulled away for good. First, West Linn senior Abdul Ali drilled a 22-yard field goal, and then — just nine plays later — Lion senior quarterback Ethan Long hit senior wide receiver on a crossing pattern that turned into a game-clinching 9-yard TD with 2:55 left on the clock. FOREST GROVE 35, CLEVELAND 0: With Forest Grove leading 21-0 and threatening to put the game away, the Vikings' Isaiah Ahmad scampered 22 yards for the home team's fourth score and the third of the junior running back's four touchdowns on the night, giving the Viks a 28-0 lead and ice what would be their third win of the season. NEWBERG 20, CANBY 7: With Newberg leading 14-0 early in the third quarter, Canby elected to accept a holding penalty rather than decline it and force a fourth-and-10 at their own 40-yard line. Instead, facing third-and-20, Tigers quarterback Gage Wright floated a ball down the right sideline for wide receiver Truman Connelly. A Canby defensive back was in position to intercept the pass, but saw it bounce off his hands and into Connelly's. Connelly ran the ball in for a touchdown to give the Tigers a 20-0 lead. The play epitomized the night for the Cougars, who seem to be on the wrong end of most of the game's big plays. SANDY 45 GRESHAM 14: With a 7-0 lead late in the first quarter, Sandy quarterback Chet Chamberlain faked a throw to his left to get the Gresham defensive back to bite, then delivered a terrific pass down the sideline to Glynne McGaughey, who bobbled the ball but eventually brought it in with one hand and went 65 yards for the score.